Life is so often a case of feast or famine isn’t it? As the saying goes, you wait ages for a bus then three come along at once. I can think of so many aspects of my life where that has been an accurate analogy but none so much as my dining habits at the moment. Ledbury last week (blog post coming soon), Five Fields next week all bracketed by various foreign excursions and wine tastings. Yes, I know I’m a very lucky girl but my liver and my waistline are not thanking me. So it was with some trepidation that I faced a mammoth dinner at Gordon Ramsay Hospital Road for H’s 39th birthday. Yep into his 40th year so may as well do it in style. Despite still bearing Gordon Ramsay’s name the restaurant has had a bit of an overhaul that goes beyond just aesthetics. In April 2013 Clare Smyth became co owner and therefore chef patron and the refurb of the dining area (and addition of a new lounge and spirits library) reflect heavily on her influence. I’ve been to Hospital Road once before some years ago and had a wonderful meal although its a little hazy as our table wasn’t until 10pm so a few pre-prandials had been consumed in the Library Bar at the Lanesborough. I do have the wine induced, late night recollection of accidentally sending the petit fours back for “not having enough dry ice smoke- they’re not Harry Potter enough“. I was therefore hoping that this visit would have much more decorum which it did, for the most part. I arrived early and spent a happy quarter of an hour playing with the wine bible whilst sipping an Ayala kir royale and munching on some fluffy little gruyere gougeres. All the big hitters you would expect from a 3 Michelin star restaurant are in there from the full gammut of Bordeaux Crus, through Burgundy and with a decent selection of non French, both old world and new. A 1947 Cheval Blanc for £6,000 or 2001 DRC for £7,800 anyone?! Faced with a multitude of courses for which it would have been hard to get one white and one red to suit all we gave sommelier Jan Konetzki a (somewhat) free rein over wine (he’s even got his own flashy website here) and we were pretty happy with the results especially as people swapped in and out different wines to suit their tastes -we must have been nightmare clients. A bottle of subtle biscuity Henriot champagne kicked proceedings off nicely and made a great companion to canapes of quail’s egg, black pudding and pork scotch eggs, cured salmon in shiso and Vietnamese style steamed buns with a soft truffled filling. 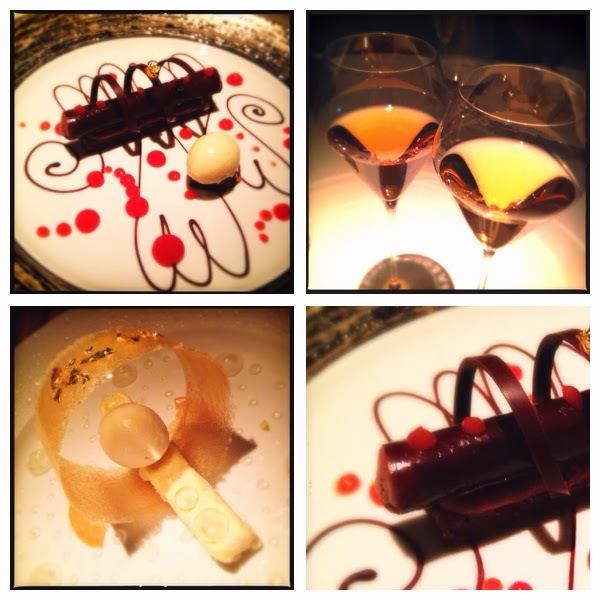 You have three menu options to choose from between a la carte, the menu prestige or the seasonal menu. They are quite relaxed about mixing and matching across the tasting menus and are genius at taking into account allergies etc. 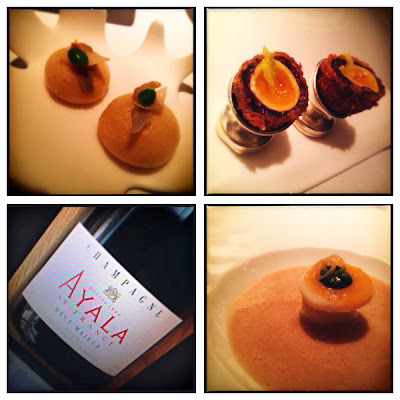 An amuse bouche of cep cannelloni topped with fried quails egg arrived setting the scene for a long line of dishes with pour-at-the-table sauces, in this case a smoked chestnut puree. I can never quite decide if application of sauces at the table is a practical thing to stop waiters sloshing it around en route and spoiling the aesthetic of the plate or if its all part of the theatre, whichever it feels like it is de rigeur everywhere at the moment. lardo di Colonnata, pickled vegetables and coral vinaigrette. The lobster itself was on the firm side but very tasty. 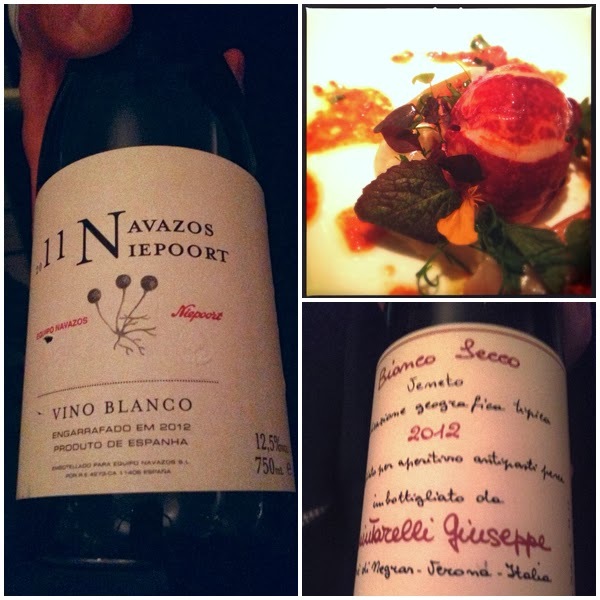 The first wine that the sommelier suggested was an unusual Navazos niepoort 2011. At 12.5% its striking towards the upper end of white from an alcohol perspective and veers into dry sherry territory on the palate. a glugger but a quality wine. The basic description ‘Carbonara’ of the dish that followed doesn’t even begin to do it justice. It goes straight into my top ten dishes of all time. It is only ‘carbonara’ in so far as bacon/ham and eggs are involved, that is where all similarity ends. A giant raviolo is filled with smoked mashed potato and a soft hens egg. The pasta bundle is then wrapped in roast iberico ham and topped with caramelised onions before being submerged in a swirl of onion veloute and four year old parmesan foam. It was just a plate of awesomeness that could never have been too big. The fact that it was paired with a lengthy & buttery Pouilly Fuisse ‘La Roche’ 2008 from Domaine Barraud resulted in a combination as near to perfection as I can imagine. So good that I’m going to hunt some down for Christmas drinking. I was far from convinced by the original wine suggested to go with the beef short rib slowly cooked over charcoal with roasted langoustine, lapsang souchong broth and English wasabi; a Suertes del Marques from Tenerife and I certainly wouldn’t drink a bottle of it but to give the sommelier his due it was a perfect match for the beef and langoustine. The wine was light enough not to overpower the langoustine but had a smoky, aromatic edge that blended well with the lapsang. The style of cooking at GRHR has definitely taken on an Asian twist since my last visit, the beef in particular being something I could have eaten in any number of Tokyo eateries. Venison loin was served on a bed of polenta, cep baked in chestnut leaf and Tasmanian mountain pepper. A waiter came to grind pepper onto the dish at the table which, combined with the polenta, all felt rather Italian trattoria (it turned out he was Italian rather appropriately). I can’t honestly tell you whether the fact it was Tasmanian mountain pepper made a difference to the overall dinner but it sounds good. (Well) hung for over 30 days, the venison had an extremely gamey taste which may be a little too much for some. Although cooked to perfection it wasn’t the best venison dish I’ve ever eaten. 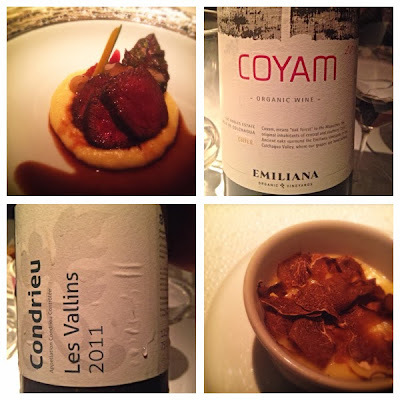 It was, however, accompanied by another rather moreish wine, this time a Chilean blend of Syrah, Cab Sauv, Carmenere, Mourvedre & Merlot ‘Coyam’ 2010 from Emiliana in Colchagua. It retails at around £15 a bottle and is available from the Wine Society and Tanners. As you would expect from a blend, it packs a reasonable punch with dark plummy notes. Whilst we are all used to H managing to throw his food and wine around the table (we’ve tried housetraining him to no avail) on this occasion he was adamant the blood red stain spreading across the tablecloth wasn’t his fault and turns out it was true. Mr Konetzki had got a bit over enthusiastic with the pouring. As a result he was threatened by the other staff with “one of Clare’s punishments”, this made the mind boggle resulting in a game of thinking up suitable punishments involving kitchen utensils for various possible aberrations (bread roll dropped on the floor? Beating with a chinois….. etc) All I can say is that it seems like he was banished to the dungeons to await his fate as we didn’t see him again for the rest of the evening. Vacherin with white truffle was a cardiac in a ramekin. Silky smooth with a generous sprinkling of Alba truffle. Most of went for a slightly astringent viognier to cut through the grease and one of our number went with a Jurancon which ordinarily I would love but remain unconvinced of its match with the slices of Alba truffle. I went back to that Pouilly Fuisse and was glad I did. with shiso, avocado and eucalyptus was realistically on the menu as a palate cleansing pre dessert but became one of the highlights of the entire meal. The eucalyptus jelly was delicate but unusual and contrasted perfectly with the apple and the fizzy sherbet added yet another textural dimension. As one of our group said “I don’t normally like apple but I love this!”. Smoked chocolate cigar with blood orange and cardamom ice cream was a delight and a piece of art on a plate. The soft chocolate filling had taken on a truly smoky, slightly salted flavour and the ice cream an inspired match thatI’ve already had a stab at copying at home. I went off piste and had a glass of Vin de Constance with it purely on the basis that I love it. Not the best match ever perhaps but I was beyond caring so much anymore. Highlights of the evening? The ‘carbonara’ with that amazing pouilly fuisse, the smoked chocolate cigar and the really rather lovely German sommelier. I’m hoping that they’ve let him out of the cellar. If you walk past and hear distant shouting, please call for help. On second thoughts don’t, who wouldn’t want to be trapped in that cellar?! 68, Royal Hospital Road, London. 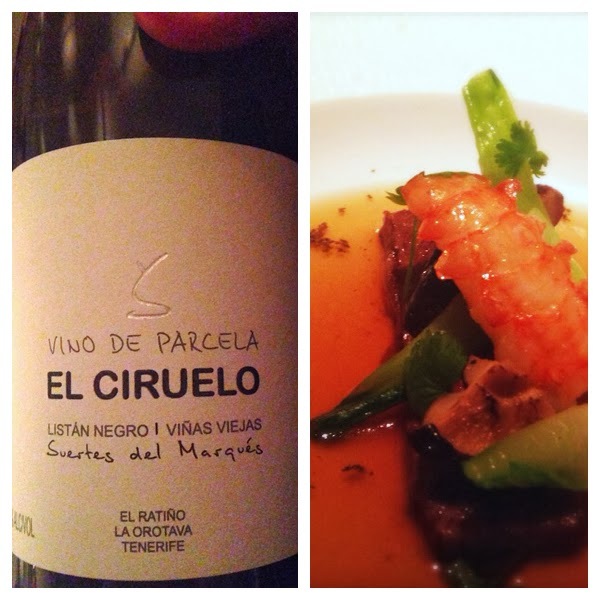 Yep – that qualifies as a gargantuan feast of food and wine in my book. The Carbonara dish does sound truly divine especially with the wine match.